HMS Queen Elizabeth has finished her historic flight tests in America. The Royal Navy’s £3bn aircraft carrier has been on deployment to the East Coast of the US for the past few months, since leaving Portsmouth in August. And to celebrate the end of the historic flight tests this week crew have finally brought out the Top Gun references. HMS Queen Elizabeth’s official account tweeted: ‘So we have managed to avoid Top Gun quotes/references for the whole of Deck Trials. ‘Tower, this is Ghostrider; request a flyby. Why was HMS Queen Elizabeth is America? HMS Queen Elizabeth was on deployment to the US as part of the preparations to get her ready to enter service in 2020. The aircraft carrier and her crew carried out a series of flight and deck trials – which saw F-35 jets land on her decks for the first time. What else did HMS Queen Elizabeth do in America? When first arriving in the US, HMS Queen Elizabeth stopped in the port at Mayport, Florida, to re-supply. The aircraft carrier also spent a week in New York City – giving the crew time to explore the famous city. As well as taking part in national and international events while anchored in the Hudson River. When is HMS Queen Elizabeth due back in Portsmouth? 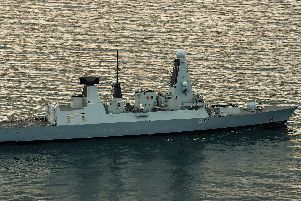 The Royal Navy won’t confirm exact movements of the warship. Although it is dependent on sea and weather conditions, the hope is that HMS Queen Elizabeth will be back in Portsmouth in December. And if all goes as planned, the carrier will be back in her home port before Christmas – meaning it should be a very happy festival period for the crew and their families.